I love discovering little gems in Atlanta, but this one is actually a big beautiful gem that is located in the heart of downtown Atlanta, Nikolais Roof. I am shocked and amazed after all of the years I lived in Atlanta I never knew this amazing restaurant existed. 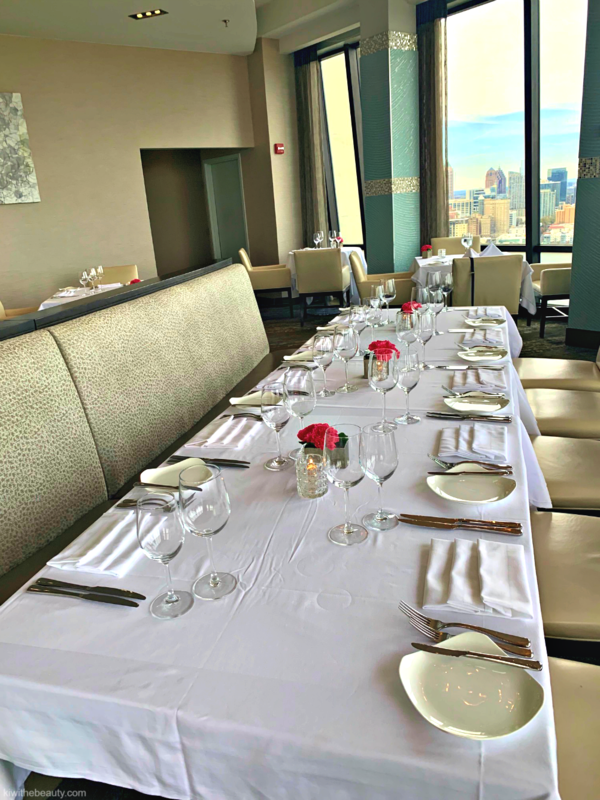 It is placed inside of the Hilton Atlanta downtown hotel at the top floor to give guest one of the best views of the city for the most premium and memorable dining experience. 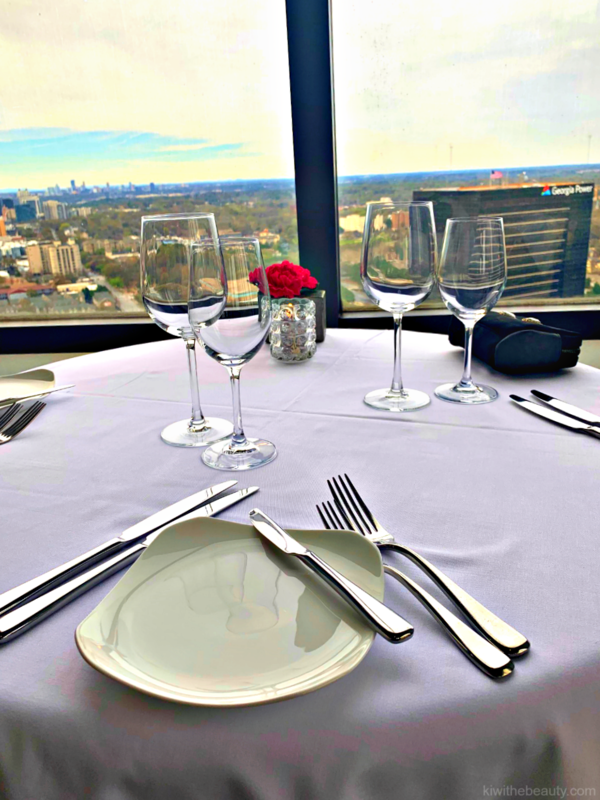 On the top floor of the Hilton Atlanta, Nikolai’s Roof delights guests with stunning views of the Atlanta skyline, masterfully prepared cuisine, impeccable service and an award-winning wine list. 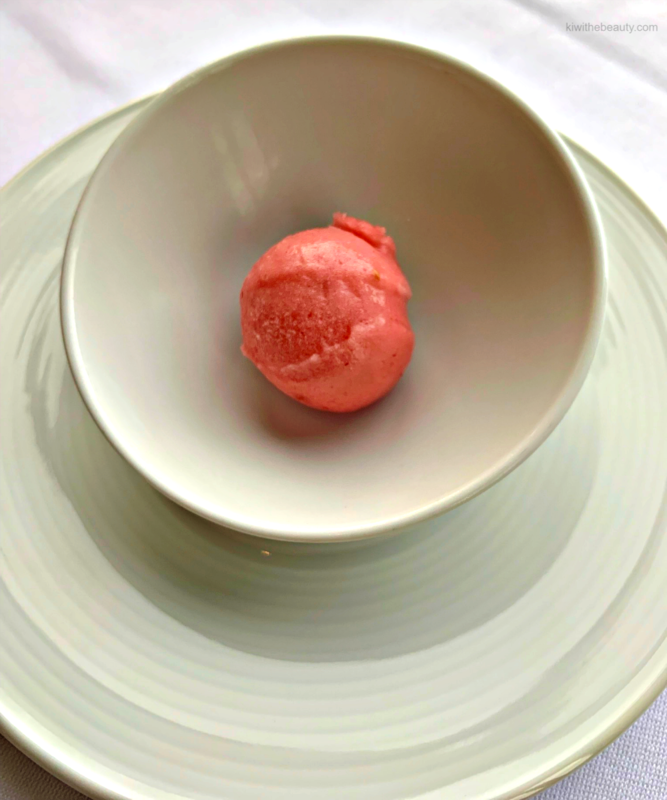 Nikolai’s Roof is a AAA Four Diamond award-winning restaurant offering a seasonally-inspired menu that features modern American cuisine with a nod to the restaurant’s Russian influences, prepared with ingredients from local purveyors. So immediately what one will notice when they step inside Nikolai’s Roof is all of the natural lighting which gives a 360 view of Atlanta. Breathtaking views. I would suggest coming as early as possible so you can see the skyline while the sun is out, then sit and dine and catch a beautiful sunset. Nikolai’s Roof offer upscale Course Menus | five course $84 | four course $74 | three course $64 items below conveys the unique style of cuisine offered at Nikolai’s Roof. 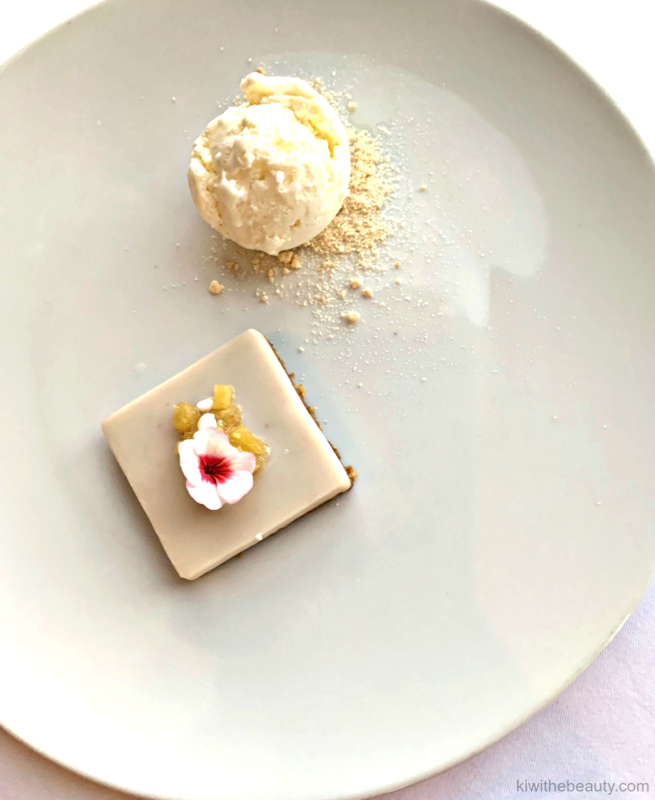 Course Menus | five course $84 | four course $74 | three course $64 . One this day I ordered from the three course menu, as items below conveys the unique style of cuisine offered at Nikolai’s Roof. 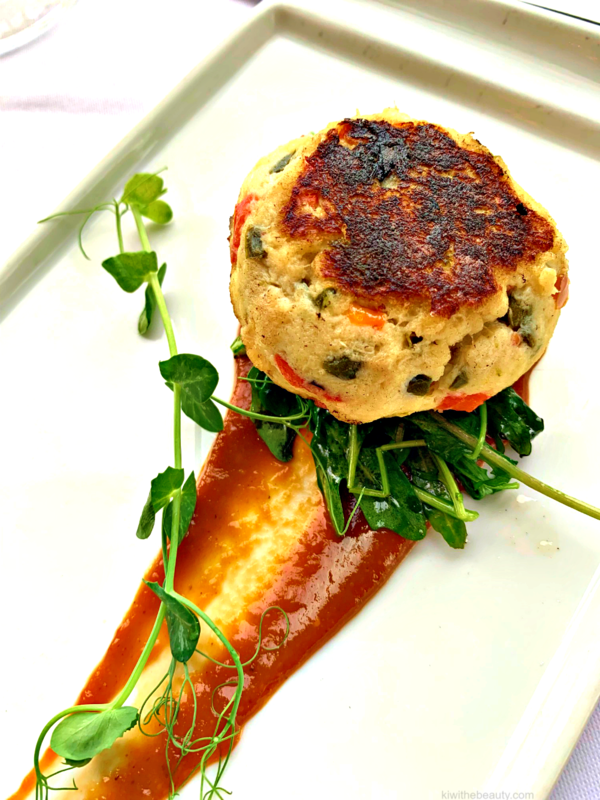 This crab cake was so decadent. One of the best crabcakes I’ve ever had in my life. I would highly recommend this as a start dish before your entree! Monday–Friday at $44 Per Person. I want to make a strong statement on how Nikolai’s Roof exceeded my expectations. The food was phenomenal but I will never forget dining with the best views of the city. I got to see the sunset as I enjoyed my amazing meal. I would recommend greatly if you want an above and beyond dining experience this would be one of the best places in Atlanta to enjoy a meal and an experience. This would make for an amazing dating night outing, birthday/anniversary celebration, or a very high class night out in Atlanta. You look beautiful and the place looks so dreamy! This sure looks like one of the heart and stomach satisfying restaurant. I love a restaurant with a great view and amazing food. I’d love to visit here if I’m ever in the ATL! 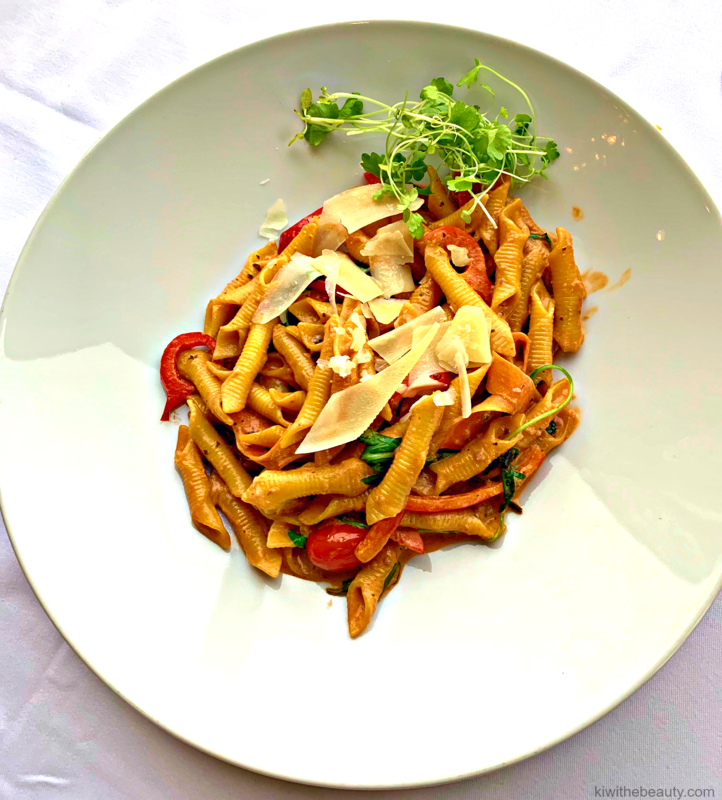 I would be interested in the Garganelli Pasta dish! Now that is one beautiful view to be able to look out over while you eat a meal. That food looks incredible as well, definitely a place to go for a special meal. I’ve never been to Atlanta, but those views are beautiful and that food looks like absolute perfection! Oh wow this is so beautiful at night! Also can we take a moment to realize how much the food looks delicious wish it was my course tonight! Roof restaurants are always special for their invariably awesome views. A must visit when I am there. What a great view! I love going to restaurants like this where the food is great but the view is even better. Not only the outside view is beautiful but their ambience is also good. I am definitely visiting this restaurant soon. This looks like an amazing atmosphere! I love that its on the rooftop! I will have to check this restaurant out the next time I visit my Auntie in Atlanta! Hopefully a press trip may bring me out there soon! That Crab Cake looks legit though! 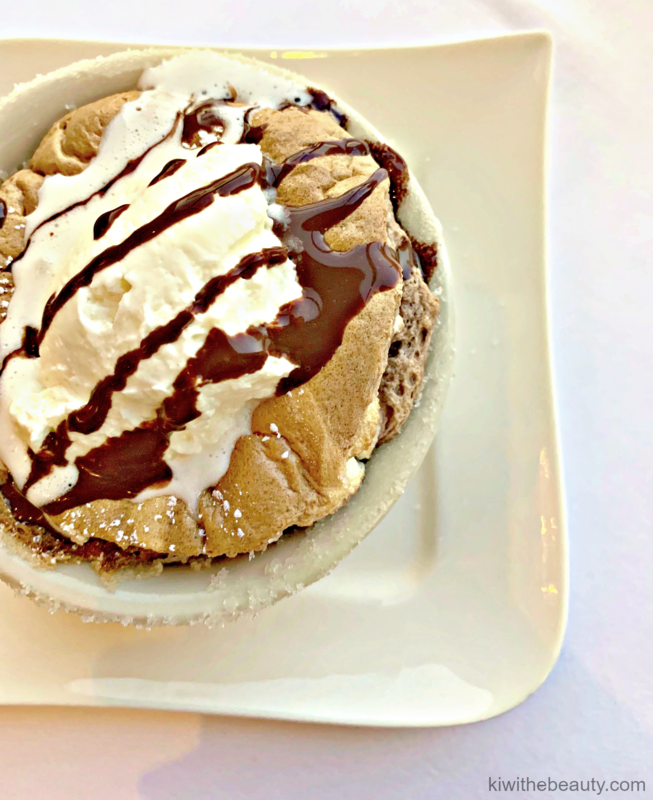 Great views and good food make for a lovely time! Wow I will absolutely come here the next time we are in Atlanta! Looks so beautiful!! This restaurant holds one of the impressive skyline view especially at night time which is a great edge to the rest of the restaurant. Food looks great! Restaurants or bars that offer a 360 ° view of the city are always the most suggestive for me! The view is so pretty and this restaurant is definitely the place to go and have dinner around sunset. The menu sounds good, especially that crab cake, which looks so delicious. My husband has been driving me crazy to spend some time in Atlanta. When I make that happen, this is going to be on the short list of places to eat. Looks AMAZING! Such a beautiful view and the meals do look really good. I wouldn’t mind a date there, maybe one day. Gorgeous! I’ve always loved roof restaurants. Plus, this food looks so amazing. Delicious food with an awesome view is awesome. This is a place that I need to visit. The food looks amazing but the highlight of this restaurant sure is the skyline! Absolutely stunning! It looks like a posh and good restaurant! I really want to visit it and dine! That food looks amazing! What a great place! I would love to visit there sometime. The view here is absolutely stunning! The food looks delicious as well! 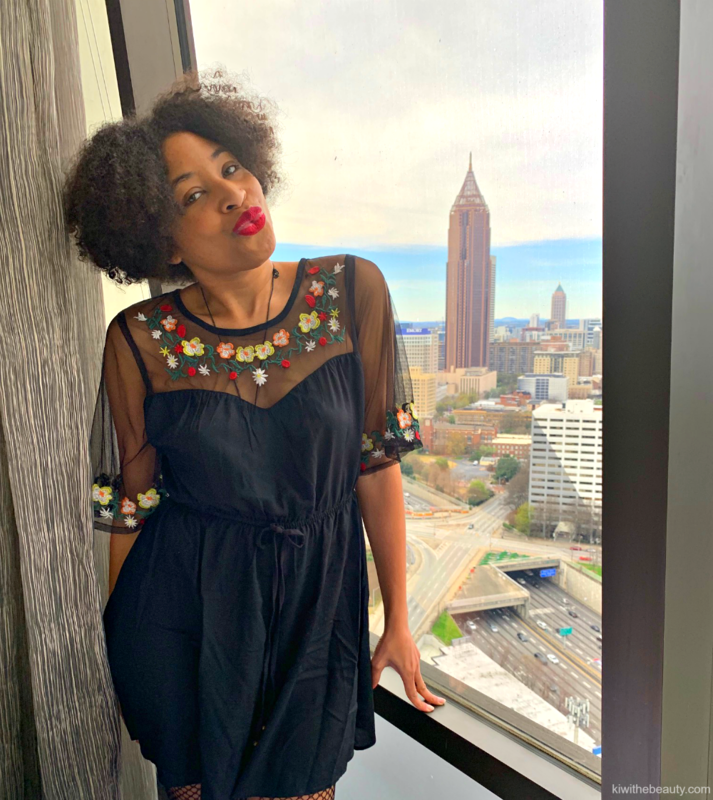 I haven’t been up to Atlanta in a while, but I have been dying to go back for a trip! I’ve been dying to go to Atlanta! This sounds like an awesome place to visit when I eventually make it there! I’ve only visited ATL once for a short time. This looks wonderful I’d love to go! OMG! 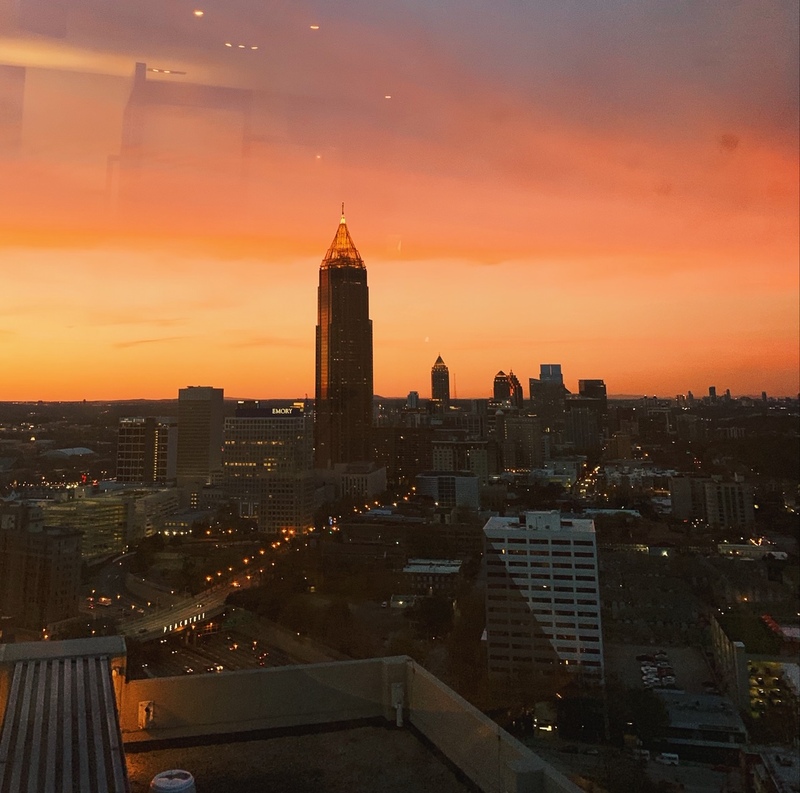 Nikolais does offer a scenic skyline view of Atlanta indeed! I would love to be there. And the whole setup plus the food is just enticing! Never been in one. You changed my idea. Gonna visit soon. This looks like an amazing restaurant for that special occasion. I really like the views out the window. I hope it is not difficult to get a window seat. The food does look amazing as well. I would love to eat there. It has been a long time since I have been to Atlanta. With classy restaurants, you either get a good view or good food. It’s so incredibly amazing that you found both in one awesome place. The food looks delicious and I would take countless photos of that skyline!! I would love to sample those dishes and stare at that beautiful view! Talk about a night worth remembering. Sounds like such a fabulous dining experience. That view is amazing, I love discovering new restaurants in my city. Wow what a view! Would love to treat myself to dining at an amazing place like this if I’m ever in this area! Everything in pictures looks amazing including you. This place is amazing. 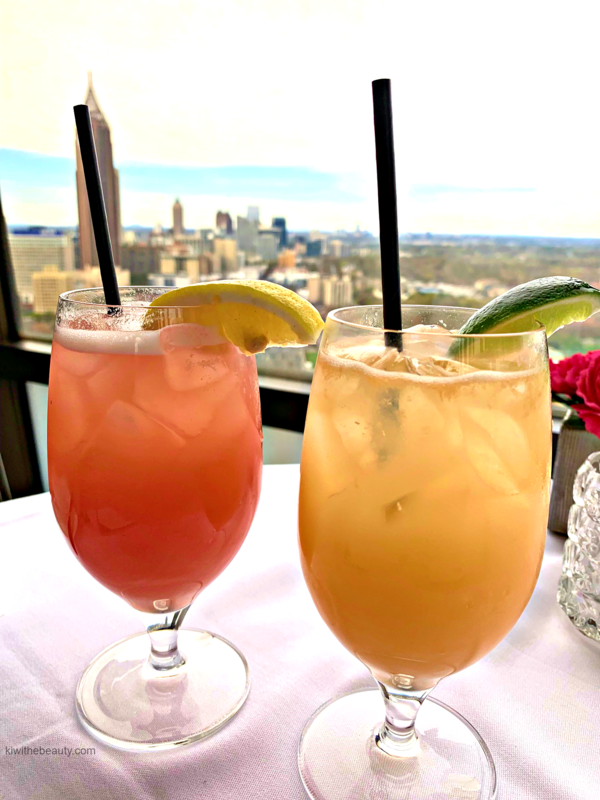 Grapefruit Palomas and Margaritas with a view? I need that! 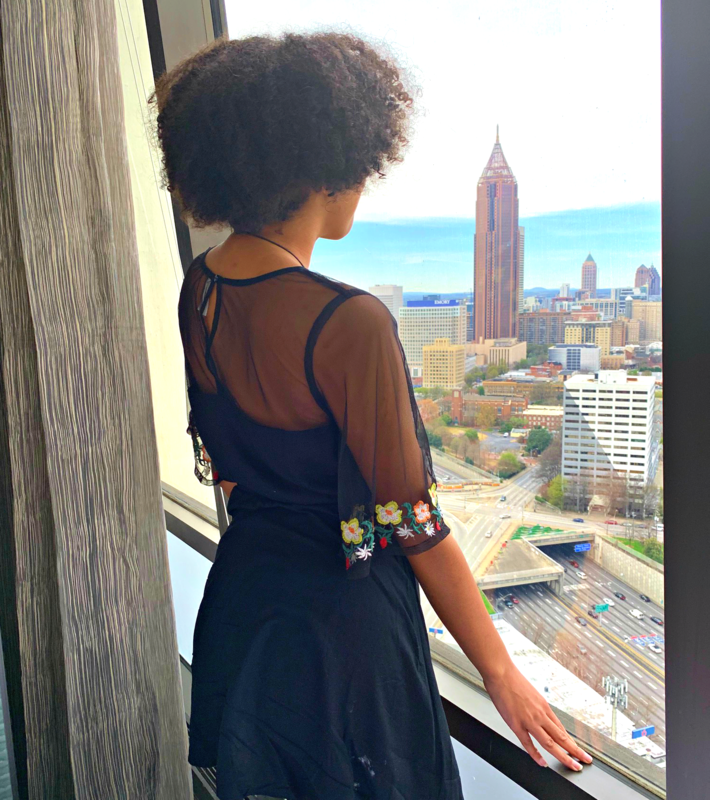 The food looks amazing and the views of beautiful Atlanta… love your post!